Send us your idea and we will create it in your custom size! Sew Lovely creates custom drapery, shower curtains, cushions, bedding and pillows in any fabric or size. We can provide regular/light filtering lining or blackout lining. We can also modify curtains that you may already have and make them smaller or add trim or blackout lining to them. 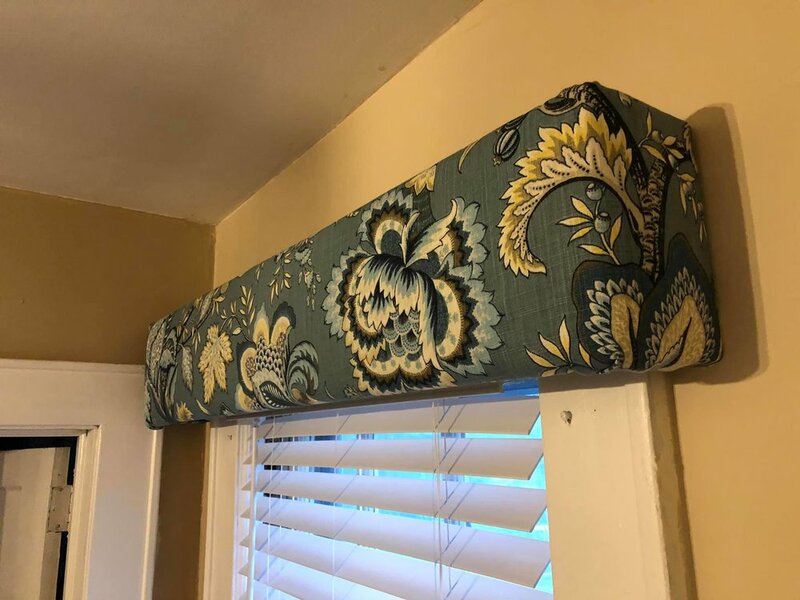 We also create custom fabric covered cornice boards in custom sizes, using any fabric of your choice. Cornices are a great way to add more visual interest to the window and add a little extra pop to the room! They are easy to hang and even though they're made out of wood, they are not too heavy. The cornice is made from quality wood and is padded and then upholstered with the customer's fabric of choice. The best weight is medium weight decor fabric or heavy/upholstery weight fabric. I will provide you with the yardage you will need when the order is placed, or you may email me for more information. A cornice that is under 48" wide with a 4" projection will usually require just 1 yard of fabric. This cornice has an 8" drop and projects 4" from the wall. If you have curtains that you would like to keep behind the cornice, you may wish to have a bigger projection. The cost is the same for larger projections/returns. 4" projection is fairly standard if you are mounting it over a bare window or a window with shades or blinds. If you would like a 10" drop we are also able to do that. Please email us for more information, as the pricing will be slightly different. Hardware is included and it's fairly simple to mount our cornices!! We provide instructions along with the hardware. The cornice comes with inconspicuous D rings attached already on the backside. You'll receive 2 brackets that you will drill into your wall to hook the rings onto. 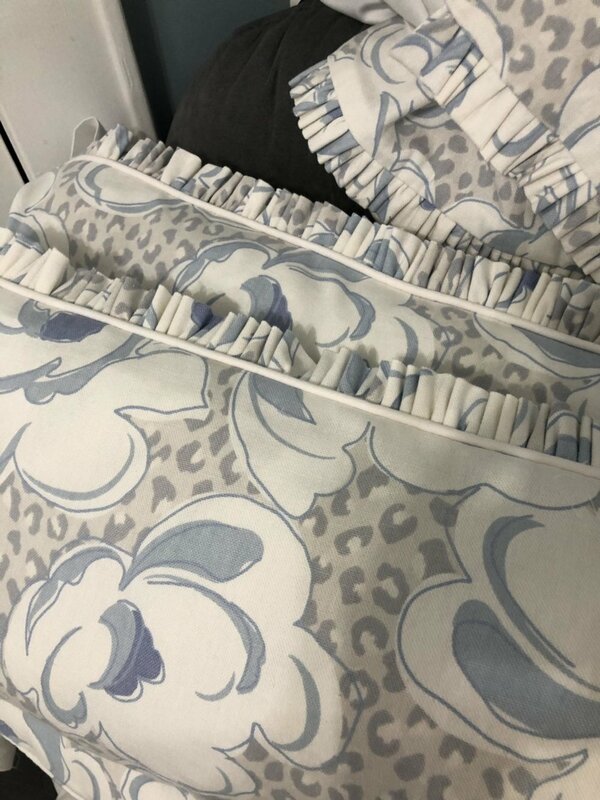 Sew Lovely creates custom bedding such as, crib skirts, bumpers, rail covers, bed skirts, duvets and more! Find a photo on Pinterest and send it to us as an inspirational photo and we’ll help create it for you! Sew Lovely creates custom pillows and cushions using any fabric, in any size. Match or coordinate your pillows to your Sew Lovely By Kelly curtains or roman shades. We make pillows in any size or fabric of your choice! Common sizes are 18"x18", 20"x20", 22"x22". Our pillows can come with or without inserts and have a zipper so they can be removed for cleaning.